astrodatabank.com quotes: "christened on the Sunday of the morning that he was born" . Time of birth: Knowing the Sunday Service customs of the day, it can be conjectured that he was born before noon with enough lead time that the family could tidy up for Church. Franklin's family was very large with many sibling helpers and they were accustomed to producing babies thus it may have been a standard task to swaddle a new baby and get it promptly to the sacristy . For Purvabhadra births of a masculine valence, the condition of prosperous, preaching, inclusive, broad-scope, philosophical, humanistic Brihaspati may considerably affect the outcome. Masculine births under auspice of Puna, Visaka, or Purvabhadra may find that their worldview is greatly shaped by the character of priestly teachers and guides. Instructional guidance is provided by emissaries from the civilizations of Pegasus. Their purpose is expansion of prosperity= proshtha. High forehead. The majority of Purvabhadra nativities are wanderers. Universalist perspective. The majority of Purvabhadra are higher dimensional Seva-wanderers who assume guidance roles. Those born into the paradigm of Aja-eka-pada are often excellent dancers who bring understanding of growth patterns via Posture and Dance . Kumbha pada 1-2-3 expresses Guru's rulership of 2-collections, affluence ++ 11-revenues, friendships. Guru-and-Shani are mutually neutral. Pada 1-2-3 births are found in the overlap between Guru's financial-social expansions (2-11) and Shani's ability to bridge the physical-astral worlds (1-12). Pada 1-2-3 are often involved in large-scale social economic networks which have both a public identity and an invisible private reality, such as international finance or government-corporate aid groups. They can also be social scientific theorists and writers on topics of large-scale social behavior. Meena pada-4 expresses Guru's rulership of 1-embodiment ++ 10-leadership, reputation. Brihaspati rules both Purvabhadra nakshatra ++ Meena rashi, creating a concentrated effect of expansive Saptarishi growth patterns. Pada-4 is less concerned with financial affluence and more attuned to visionary truth. Pada-4 may become leaders in wisdom fields such as divinity, philosophy, spiritual healing, clairsentient understanding, envisioning practices, or ancestor guidance. "... high-strung and nervous in temperament . They are not very strong constitutionally. and are more interested in the discussion of serious topics than in trivial matters. preferring to arrive at their beliefs through a process of logical reasoning." 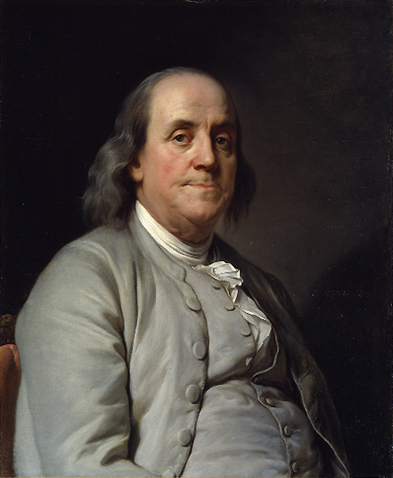 "BenFranklinDuplessis " by Joseph-Siffrein Duplessis - http://www.npg.si.edu/exh/brush/ben.htm . Licensed under Public domain via Wikimedia Commons. Lifepartner for Chandra-12-Kumbha = Simha-6 ruled by a weakened Makara-Surya-11 in 6th-from-6th. 7th navamsha Makara contains Rahu, irregular and powerful associations. In the masculine nativity, Zukra-yuti-Mangala suggests bisexuality and two life-partners, with the first partnership suffering effects of bhava-6 while the second partnership is generally more attuned to one's authentic personality identity and body-type. However nichha-Shani-2 prevents a second ceremonial marriage. Mr. Franklin had marital problems, however he was never legally married and therefore he was never legally divorced. During Ketu-Ketu swabhukti, he simply walked away from his wife and grown children. When his wife died in Philadelphia, he was living in London, and he did not return for her funeral. In 1923 (age 17) Franklin had proposed marriage to Ms. Read, but his suit was rejected by Deborah's mother (not by Deborah). He then left and worked in England for three years during which time he failed to communicate with young Deborah. Read. Following her mother's wishes, she married another available suitor. She was swiftly abandoned by her first husband, who absconded with her dowry and fled to Barbados. Due to the bigamy laws of the day, she could not remarry without showing clear evidene that her husband was dead. Conclusive proof of his decease proved impossible to obtain. The revolutionary, emotionally turbulent, perpetually transformative, trauma-inducing 8th-from-Chandra -12 becomes bhava-7-Kanya contracts and partnerships. This yoga suggests that, particularly during Vimshottari bhukti of Budha, one must engage with identity-transforming conditions regarding contractual terms of agreement. The adversarial 6th-from-Chandra-12 becomes bhava-5-Karkata children, creativity, gambling, celebrity, politics This yoga suggests that Vimshottari bhukti of Chandra can provoke emotional disagreements with the routinized folk culture and expected safety of the creative intelligence or speculative games. Any graha located in bhava-12 can also prove inimical to one's basic emotional nature. Mangala rules Arudha lagna Vrizchika containing Ketu. bhava-9 * doctrine * fortune * wisdom * philosophy * theory * creativity Franklin was an advocate of common sense in lieu of received truth, and while open to listening to various ethical arguments was not an adherent of any particular sacred teaching nor any fixed political doctrine or scientific ideology. His father (Ketu-9) expressed little interest in Franklin's welfare and ignored Franklin's many requests to be freed of his exploitive apprenticeship. The constitutional government (10) established by Franklin and Founding Fathers was articulated in a principled fashion which left room for interpretation (Mangala rules-2) and transformation (Zukra-rules-8). Predominantly, and as a vigorous response to the overthrow of rulership by hereditary royalty, Franklin's vision required that the government support a free economic system (Mangala rules 11) rather than the economic system be used primarily to support the government (10 = 12th-from-11th). the principles of social governance which Franklin helped to formulate, write, and publish in the 1770's did provide the basis for a soon-to-follow explosion of American goods, services, inventions, and ideas. Indeed, by diverse application of these innovative principles, the USA showed what was really "new" about the New World (Mangala pioneer). Budha ruler of 4-settlement located in 11 = 8th-from-4th new identity new homeland. Franklin helped to lay the foundation for the huge growth of European cultural settlement in USA . Karako bhavo nashto for the eldest child. Franklin's eldest son was notoriously difficult, even life-threatening toward his father. His first child was born out of wedlock in approximately 1730, and to this day no scholar has been able to identify the child's mother. However scholars speculate that William's mother may have been Ms. Deborah Read who became Franklin's life-companion. Young William first became Ben's business partner and confidante, then later William developed into a bitter political adversary. a remarkable feature of the Franklin family line is the impetuous production of children born outside of marriage. 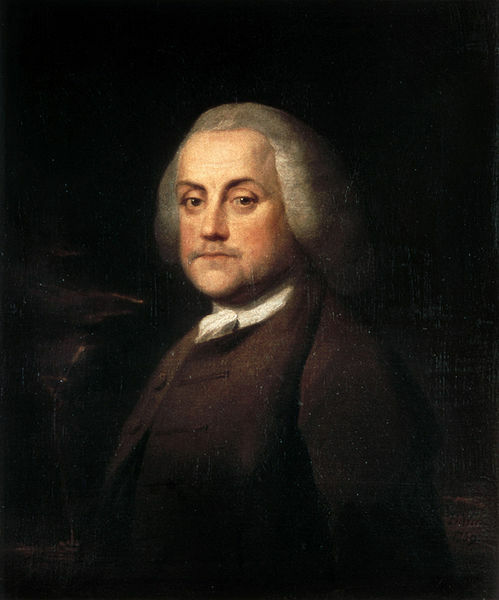 Not only was Benjamin Franklin the father of illegitimate William, but William himself father of an illegitimate son named Temple (mother unknown) and finally Temple himself fathered an illegitimate daughter (mother known). bifocals, lightning rod, library chair, swim fins, the long reach device, Franklin Stove, urinary catheter, and Daylight Savings Time. Franklin discovered and mapped the Atlantic Ocean Gulf Stream, many properties of Storms and Lightning, and other arcane items -- all of which he shared for free (declining all patents) For each invention-or-improvement, Frankling published its complete drawings, plans, and materials (uttama-Rahu-3 publication of unusual messages). Vriddhipathi-11 nichha-Shani-2 creates a substantial Dhana-Yoga, but the work is demanding and the family of origin is not supportive therefore one begins with no capitalization from the family coffers. It is a yoga of self-made wealth via determination and hard work with regular delays and much resistance. 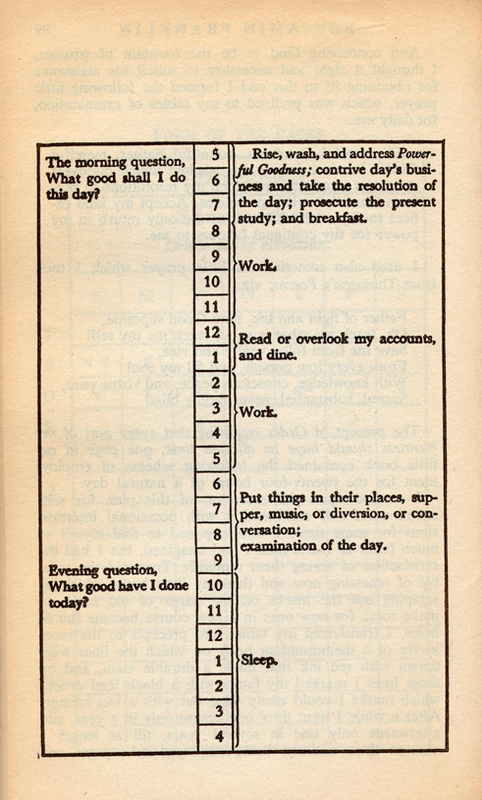 Way to Wealth 1706-1790 printer ambassador Benjamin Franklin was a younger son with numerous elder siblings. As a youngster, Ben was sent by his parents to work as an indentured servant in his elder brother's printing business in Boston. Having quickly learned basic printing skills, and feeling abused by his exploitive brother, Benjamin broke his indenture and escaped to Philadelphia while still a teenager. Many years later he repaired relations with his economically minded parents, and became an agent of trans-Atlantic networking on behalf of the newly born USA. He lived many early years and most of his final decades in England. uttama Rahu-3 suggests substantial financial well-being via writing-printing-documentation-publishing. 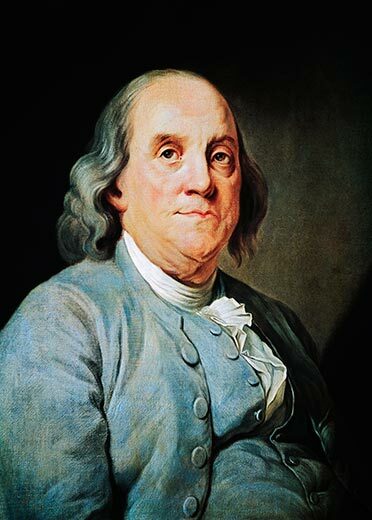 Franklin's Autobiography is an American perennial favorite, having remained in print for nearly 225 years and consistently taught in American literature classes of univerisities. Budha-11 ruler of 4 suggests his ability to profit from the aphorisms which he snatched from the folk wisdom of the farmers living around him. Ketu in Bhava-9 * scatters sacred doctrine, disperses Father, global traveller. 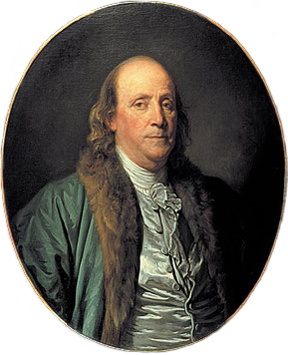 Benjamin Franklin travelled frequently to Britain and France. Disregarding (Ketu) the customs of the day, he was known to have had extramarital romantic interests specifically in England where he resided on-and-off for years. Franklin was an exceptionally undogmatic writer, displaying a level of humorous neutrality rather rare in his ideologically contentious era. This delightful aberration is due probably to the strength of articulatory Budha and corresponding weakness of lowest-common-denominator Shani, along with Ketu-9 dispersion of catechism and dogma. Notably, he advised his son that older women (Shani) make better partners, despite the popular beliefs being quite the contrary.